The skin of the neck and décolletage (upper chest) is one of the first areas to show aging and sun damage. Even babies have horizontal lines on their necks, but as support under the skin surface weakens with age, the skin of the neck begins to appear loose, crêpey and finely wrinkled. Sun exposure further damages the skin, and both redness and dark spots appear on the neck and upper chest. A thin layer of structural fat under the skin of the neck and décolletage restores support and over time will improve the texture, tone and quality of the skin and reduce the appearance of sun damage. Before (left) and six years after last fat injection to entire surface of neck. Note obliteration of neck creases. One of the hallmarks of youth and beauty for both men and women is a contoured jaw line. 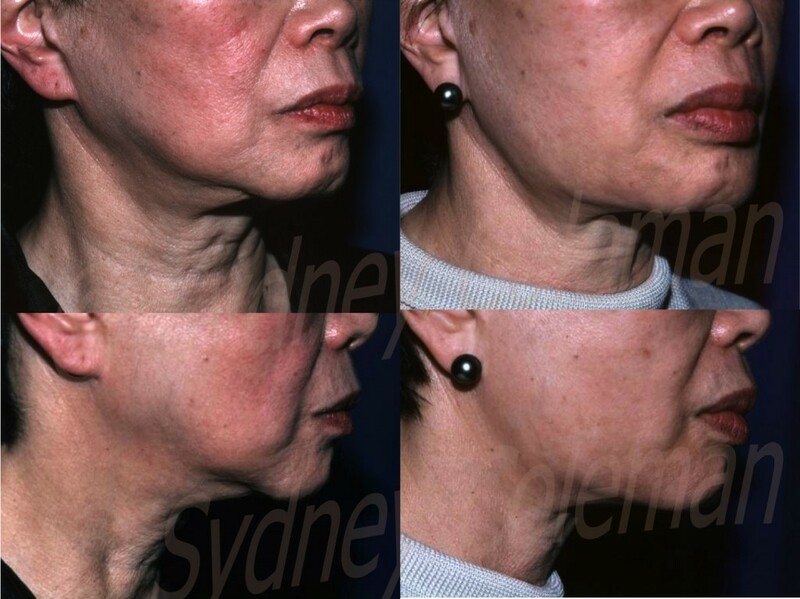 As we lose fat underneath the skin with age, the jaw line and chin area become weaker and less defined. 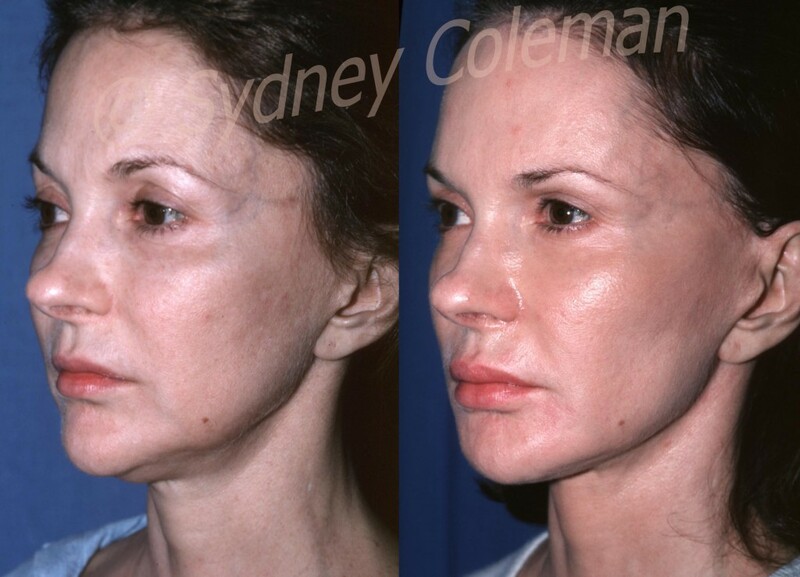 There is evidence that we also lose some volume in the facial bones themselves as we age, only adding to the problem. Those who had strong jaw lines when younger will notice a subtle “waviness” to the chin and less of a demarcation between the neck and back of the jaw. 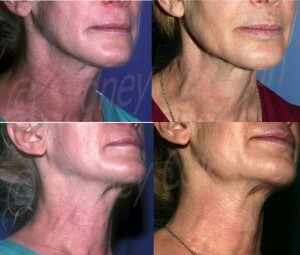 Some patients never had sharp chins or jaw lines even in youth, but both of these conditions can be corrected with the addition of structural fat. 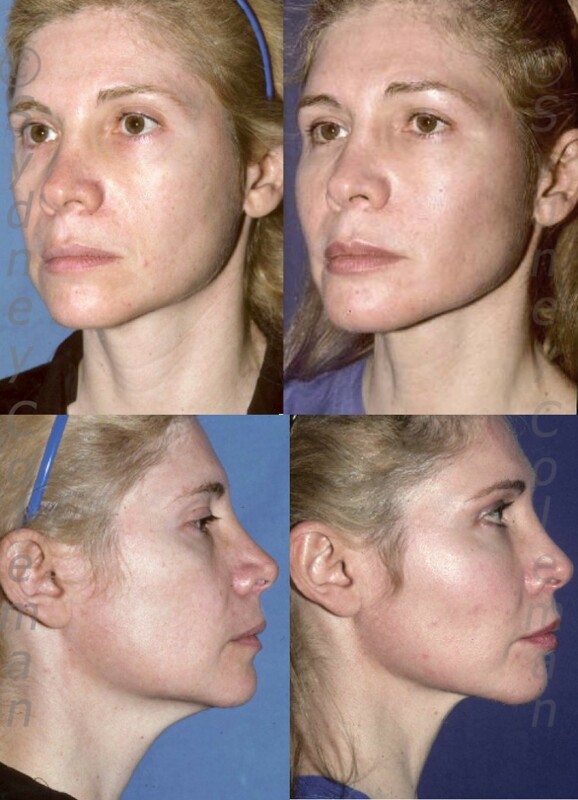 An aging, soft jaw line can be strengthened and sharpened, a receding chin can be enhanced without artificial implant surgery, and a jaw line that was never prominent can be made so. The advantage of using fat to enhance the chin is, of course, that it is totally natural, and also that we can place fat exactly where we want it, and are not limited by the size or shape of implants. And of course the fat grafts are long-lasting. We can “custom fit” your chin. In the same vein, we can shape your jaw line without breaking any bones and doing major reconstructive surgery.